I’m a pretty good challah maker. Actually, I’m being too modest. 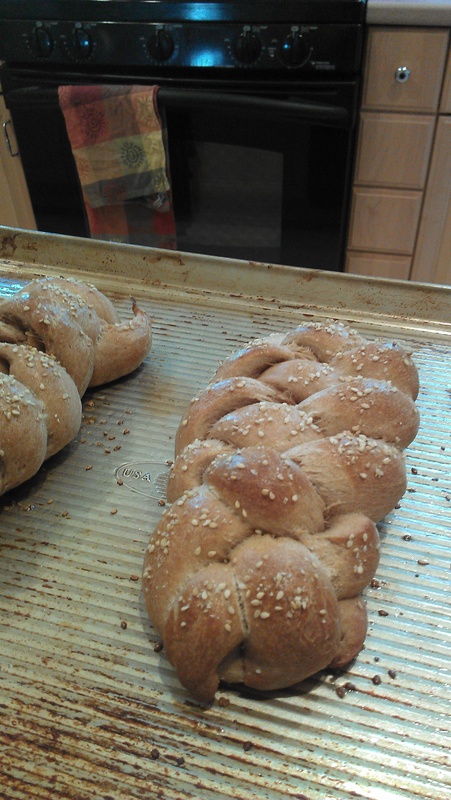 I make some of the best whole wheat challah most people have ever tasted. I think that part of the reason it comes out so well is that at crucial points in the process, I don’t rely on measurements in the recipe, but I rely on my senses to see what is actually happening with the dough. I add flour to the liquid little by little, so that I get the exact right consistency for the dough. I can feel the weight, the bounciness, the shine of the dough. I know in my hands when it is ready. No measurement in a recipe could get that kind of accuracy. Simply following measurements in a recipe you don’t know all sorts of things like the exact coarseness of the flour, the temperature that day, the hardness of the water, etc. When you knead and feel the dough, you get exactly the consistency you want. It turns out, this intuitive approach is also the secret to Jewish civilization: for centuries Jews have followed Jewish law, in Hebrew: halakhah, a word that comes from the word “to walk.” It is a path, an active going one step at a time. It is not some theory proposed by a philosopher in an ivy tower. It is not a recipe. It is, at least when it is working well, a constantly evolving, constantly fine-tuned feedback between lawyer/scholar/teachers (rabbis) and the rest of the people who are living out Jewish life, walking on the path. There is no one set of principles or abstract deductions on what is Right or Truth. Rather, there are stories, examples and arguments all woven together. Any rabbi or practicing Jew who wants to decide a question of Jewish law needs to have a feel for the law and a feel for the community and the individual people involved. Then a decision can come out exactly right for that moment. Of course it didn’t and doesn’t always work that way. But apparently it has often enough that the Jewish people survived for 2000 years in difficult exile and are miraculously still here today. The organic structure of learning, action, law, has been flexible and durable, like an eco-system adjusting to new conditions and continuing to grow. In the case of making challah, the key point is that the baker has to develop a sensitivity to the dough. He or she needs to be in second to second contact and feel in his hands the dough’s weight, stickiness, bounce. It’s a feedback loop, as the dough responds to my hands and my hands respond to the dough. In the case of an organically alive Jewish community, there is a constant, dynamic, shifting and alive feedback loop between the tradition and the lives of the people. It’s not limited to rabbis and big legal decisions. Even a simple thing like opening a book of the Torah, Talmud or other book of Jewish learning – when it is done successfully it is a back and forth interaction between our perceptions, values, insights and the text. And the text, of course, itself is a record of centuries of such conversations. There is never one clear solution, but many perspectives. One day I might be swayed by this argument, another day, with some new information or changing circumstances, I might see something new. The beauty of baking bread, or any craft, is that because you are in a feedback interaction with something, it is never possible to completely control it. You work hard to perfect your craft; you have discipline and consistent practice to build your skills in order to get something beautiful. But so much of the beauty actually comes from the surprising things that happen not as part of your plan. The real accomplished artist knows how to ad lib and play off the aliveness of the work. I’m powerfully reminded of this whenever I walk on the historic breakwater in Rockland, Maine. I always marvel at the way the huge slabs of granite were placed there, 700,000 tons of them are lined up, almost perfectly in a line on one side, and more random on the other side. You can see the dynamic process recorded in the pattern of stones. Someone back in the 1890s was making aesthetic decisions, planning where to place each granite slab, but only so far; also improvising and reacting as each stone is put into place. There is a beautiful aliveness in this record. It’s the beauty of all craft – it is always a feedback loop of action and reaction, a living system. It’s a record of the interface between our striving for order and control and the dynamic randomness of the living world. Whether its baking Challah, building a rock wall, or trying to figure out what God’s will is for me in this moment – we’re always asked to stay awake: using our skill and to shape and form, but always open to feedback, looking, listening and feeling for that perfect moment of aliveness. In that way, we’re always on the path. I love this exploration of the tension between “right brain” and “left brain” – there is this ongoing tension in our lives and it can appear everywhere, in cooking, in learning and in living itself. Thank you!! Or, we could follow the Ishbitzer rebbe’s ideas of spiritual development and say, it’s OK for beginners to stick to a precise recipe, but as we grow we realize we need to use our improving skills to work with the dough directly. A dash of this, a pinch of that. The challah analogy is beautiful. Feeling the dough in your hands, in terms of halakhah, is similar to what my professors at HDS refer to as pastoral care. The recipe is important but it’s like an example; you can’t expect precise application in all cases to turn out well. This post gives so many examples of why that is so important in applying halakhah in our lives and guiding others on the path as well. I’m a better singer than baker, so it occurs to me to say — Halakhah should be observed the way music should be sung: soulfully, not precisely.